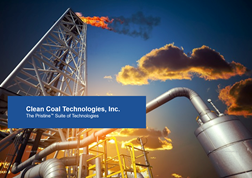 CCTI’s proven and patented technology reduces the amount of moisture and impurities from raw coal and increases the BTU value. The end product is dust – free, supportive of the environment and economically enhanced. Robin Eves, President & CEO of Clean Coal Technologies, Inc.